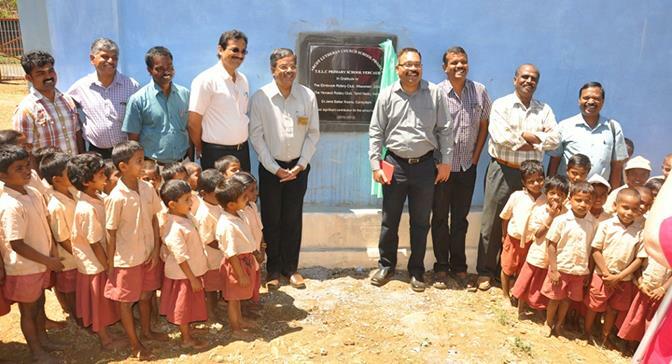 These two Rotary clubs have joined together to uplift the Arcot Lutheran Church Yercaud School where the students come from tribal villages scattered throughout the hills. Because their homes are long hours of walking and bus rides away, the school also serves as a boarding home. The dedicated teachers nurture and educate the children 24 hours a day, seven days a week, eleven months a year. The Elmbrook Rotary Club has provided jump-start funding for an actively used library, a new toilet and shower block, renovation of the sleeping and dining rooms, a new kitchen and two phases of a new classroom building. Elmbrook has also supported clearing of wasteland for a bountiful kitchen garden. For their part, the local Yercaud Rotarians make sure the children have nutritious food, warm blankets and clothes, uniforms, school supplies and activities and equipment for after-school and weekend activities. A significant contribution is their oversight of the construction to insure the Elmbrook projects are of high quality. Now the partners have larger goals. The Elmbrook Rotary Club and District 2980 are joining together to work on a Global Rotary grant that would impact thousands of students. The grant focus is the new e-learning program developed by Rotary in India. If the grant process is successful, this technology would benefit the 94 ALC schools as well as other schools in this large district. On August 1, Past District Governor and Assistant Regional Rotary Foundation Coordinator Asoka will make a presentation to the Elmbrook Rotary Club. The time together will give the partners an opportunity to discuss strategic details on how to proceed with the grant process. For more informaiton on Elmbrook Rotary's involvement with the Yercaud School, please contact Dr. Dave Engle at dengleone@gmail.com. Thanks to Elmbrook Rotary Honarary Member, Dr. Jane Baker Koons, Consultant to the ALC School Project for her ongoing efforts with this program.